Books can make you love a place, or at the least the spirit of a place. Lately I’ve been missing the part of the country where I grew up, and so I’ve sought out books that take me there. This week I read, Where Rivers Change Direction, by Mark Spragg. I used his stories, his experience, his adept configuration of words, to take me back to the Rocky Mountains. His love for the ranch in Wyoming where he was raised came through and I could hear the elk bugling, and the coyotes calling and the sound of water running over a rocky streambed. The way his characters talked—their concerns, their desires, the hardships some of them had to endure—they were familiar, like people I’ve known, or at least like people my people have known. 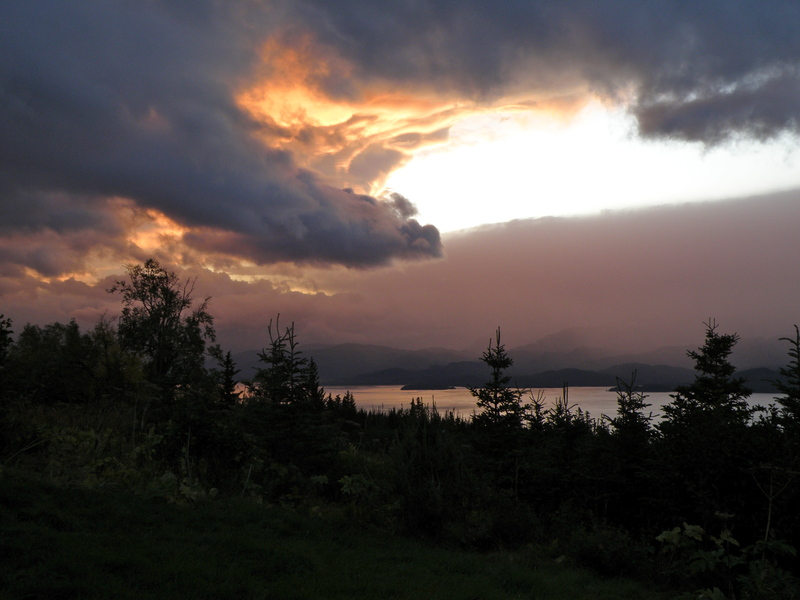 It’s a hard thing for me to admit, but I’ve been disillusioned with Alaska lately. Or maybe a better way to say it is that I’ve been disillusioned with my experience of living in Alaska. When we moved here looking for adventure nearly twenty-two years ago, we thought we had an idea of what living in Alaska would be like. No doubt about it, we were naïve. We thought that it would be just like Montana, but bigger. We also had no concept of the realities of full-time employment or of the way our lives would change once we had children and a mortgage. We never anticipated how difficult it would be to access so many of the wild places we hoped to explore or that getting to them would require more money, time and work than we could manage. We imagined a life in Alaska that was somehow like the books we had read: Margaret Murie’s Two in the Far North, Nick Jans’ The Last Light Breaking, Edges of the Earth, by Richard Leo, Shadows on the Koyukuk by Sidney Huntington and Jim Rearden, and Nancy Lord’s collection of short stories, Survival. Those books made me infatuated with this place. They gave me an idea of what I thought it meant to be an Alaskan. When we planned our move north, I imagined us rafting interior rivers, flying into the remote Brooks Range and hiking for days. I imagined long winters with deep snow and of spending those dark, cold days tending a fire and writing, cooking, snow-shoeing to a neighbor’s house for a visit and a cup of tea. But even here, in this place that blows my mind with its beauty, a hectic life seems to have worked its way into the forefront of our existence. We go to jobs five days a week. We stress about paying the bills. We spend our weekends doing house chores and recovering from the workweek. When we have extended breaks we tend to fly south to visit family. And the Alaskan life we read about all those years ago in anticipation of living here goes largely unrealized. I’m not meaning to whine here. I’m just trying to think this through. I’m trying to discern whether it’s a lifestyle I’m longing for, or a place. The two might be connected. The lifestyle I crave might be better found where the cost of living isn’t so high, where public land and diverse landscapes can be more easily accessed. I’m wondering if we should stay here longer and give ourselves some post-raising-children time to enjoy this incredible state, or if we should go be closer to extended family or to the part of the country I think of when I think about home. And what does it mean that I still call someplace else home? It might mean more than all of the ways I try to rationalize, it might mean more than all of the books I read or sentences I write. The discussion of whether to stay or go has been constant for a while now, so much so that I’m starting to get used to this state of uncertainty. But until we’re able to make a decision, or a change, I’ll continue to walk out my door every day and feel glacier-cooled air on my skin. I’ll watch the way the wind plays on the surface of the bay, turning it different shades of green and brown and gray. I’ll marvel at how the light and shadows settle and spill across the mountains. I’ll stand on this shelf of land where I live and look east toward the Fox River Flats and west to Cook Inlet and beyond. I’ll be humbled and inspired and overwhelmed by the bigness of it all. My own story about living in Alaska is still unfolding. It may have more to do with exploring ideas of home and belonging than it has to do with climbing mountains or fording raging rivers. It may be that my story of living in Alaska is simply about uncertainty, and all of the ways this place has taught me to embrace it. “Beware the spring equinoxal,” she’d say. 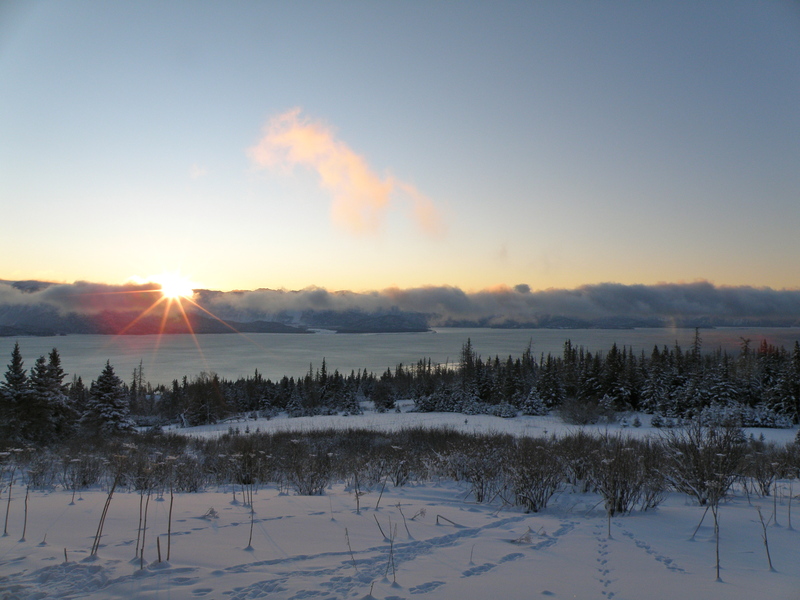 Right now in Homer we’re gaining around five minutes of daylight a day. We’re looking at seed catalogs and planning our summer camping trips. The dirty snow berms on the side of the road are receding and the sun is high enough on the horizon to throw a little heat. Tasks that seemed overwhelming just a couple of months ago seem possible now. And yet, suicide rates go up this time of year. The police blotter gets interesting and mental healthcare facilities fill to capacity. Couples who’ve held on through the winter give up and go their separate ways. It seems counterintuitive, but it’s true. This is a tricky time of year for lots of people. When it comes to the spring equinox, Sadie was on to something. I’ve been thinking about Sadie lately, wondering about her life, of which I knew very little. I was a teenager when Sadie used to make her way from the little shack across the alley to our house. But honestly, I never gave her much thought. To me she was just an eccentric, dirty old woman, poor and living in a decrepit cabin. I knew she had a husband over there, a man called Monty, but I never really got a good look at him. They just existed there, on the edge of town. When I think about it, I’m not sure how. I asked my mom about the old couple that used to live behind us, and she told me what she knew about Sadie and Monty Holbrook. Sadie then told my mom that she’d grown up on a horse, had in fact ridden one from Canada to Mexico with an infant in front of her and a two-year-old behind her. “No horse would dared lay down or buck with me,” she said. After the horse incident, Sadie talked more. 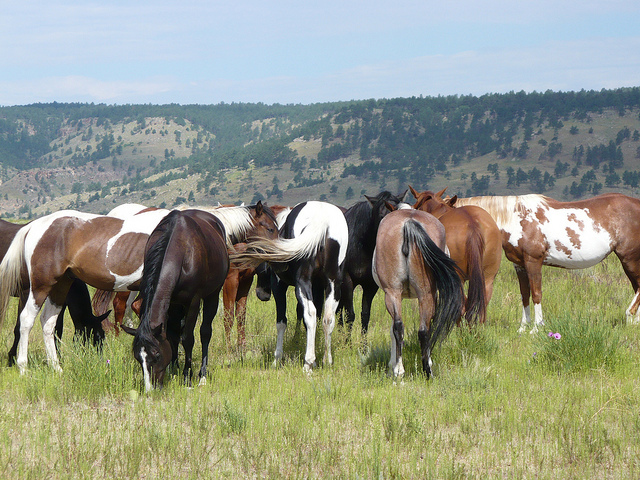 She said she and Monty caught and broke wild Spanish mustangs for a living and trailed them to North Dakota. She also told my mom that Monty, who was ninety years old at the time, used to run with Butch Cassidy and The Wild Bunch. At one point a movie producer found him and wanted to interview him, but Monty chased him off with a gun and told him to “Git.” He was afraid that if people knew who he was he’d be arrested and hung. One Easter Sunday morning, after I’d already moved out of the house, my mom and step-dad saw smoke billowing out of Sadie and Monty’s cabin and called the fire department. It was late in March. Medics came and took the two of them to the hospital. There they were treated for mild smoke inhalation, but other than that were found to be in good health. Monty put up quite a fight though, when the hospital staff tried to get him to bathe. He was of the belief that bathing too early in the year made one susceptible to pneumonia. After their house fire, Sadie and Monty never returned to their home. They went to a nursing home in Fruita, Colorado to live near their daughter. My mom heard that Sadie was happy there—it must have been a huge step up in terms of ease of living—but Monty didn’t like it much. He died within the year. Sometimes we wouldn’t see Sadie for several days, but then something would change and she’d come over several times a week. During the times when she’d visit frequently, she’d watch for us to come home. We couldn’t see her peering over, but moments after we pulled into our driveway we’d see her hunched figure making its way across the dusty alley and up the stairs to our back door. I wish I had a picture of her now to remember her face, but more than a picture I wish I had a week of afternoons with Sadie. I’d ask her what it was like to break wild Spanish mustangs. I’d ask her what it was like to be married to an outlaw. And I’d ask her to tell me exactly why she was so wary of the spring equinox. I’m guessing she had more stories to tell. It’s the beginning of a new year—one that will be different for sure in our family. Dillon will be heading up to UAA in a couple of weeks and in the fall Adella will be going to high school in Montana for her junior year. The house will be emptying out a little sooner than I had expected, at least temporarily, and anticipating that change gives me a different perspective on the present. Suddenly spending quality time with my family feels kind of urgent, and yet I’m finding that teenagers don’t necessarily feel the same way. I’m trying to guard against being too sentimental. It was challenging to stay caught up with my writing in December, so one of my biggest goals for the new year is to start acting like a serious graduate student again. I’m not so far behind that I can’t get caught up, but I have to find the time to write and then use that time wisely. I’m not sorry that I took a break though. I had a great visit with my mom and two older sisters earlier in the month when they came to see Homer’s version of The Nutcracker and the holidays, with everyone at home, have been great. A little break from writing has been nice, but I’m ready to face the new year now. I find that I’m a bit of a New Year’s geek, always getting introspective and thinking about what I want to change about my life with the change of the calendar. I can’t decide if it’s optimism that makes me this way or if it’s chronic dissatisfaction with the status quo. Either way, I always seem to want to try harder, tweak a few of my habits and generally work on self-improvement. Last year was great in many regards. I started an MFA program that I’m excited about. I cut my sugar consumption way down. Things are good with my family. But I can see that I unintentionally cut back on a couple of things that bring me a lot of joy. I went a whole summer without going camping or stepping foot in our skiff—and summers in Alaska are way too short to not get out and enjoy the nature that’s all around. I live in a beautiful place, with a stunning view of the mountains and the bay, but sometimes I need to leave my five acres and get out there. That has to be a priority this year. The other thing that I didn’t make enough time for in 2011 was music. For the past decade I’ve made playing music a huge part of my life, and it’s one of the things that fills me up. It gives me what I need to go about my less than exciting life of driving around, going to work, doing dishes, cooking dinner. And as much as I love writing, it doesn’t do the same thing for me. Music takes me out of my head. When I get together with friends to play tunes I lighten up. I drink a little. I crack jokes. When I’m alone and I work on learning new tunes it’s a lot like meditation. My mind is clear for a while of all my responsibilities. I love writing, and it gives me fulfillment in a different way, but it’s heady stuff. When I’m concentrating on writing I tend to take myself a little too seriously. I need to find a better balance. So my hope for 2012 is to make time for music. With it being an election year, I’m also hoping to spend less time reading the Huffington Post. To me it seems like my time will be better-spent reading poetry, playing music and having fun with my family. Of course I want to stay informed, but I don’t want to get worked up this time around. I’m also anticipating a trip or two (who knows, maybe more?) to Missoula when Adella is down there. I have nothing but fond memories of my time in Montana when I attended the U of M and although I’ll miss her terribly, I’m happy to have a reason to go back. The mixed feelings I have about her going are eased by knowing I’ll get to visit, and by trusting that she’ll be in good hands while she’s there. One of the things I love most about the MFA program that I’m in is that it requires of me a tremendous amount of reading. Every month I have to read and write a response to three books. This requirement forces me to focus closely on how a book is written, how its essence impacts its readers and how I might learn to do the same sort of thing in my own writing. When I applied to UAA’s low-residency MFA program I had to choose between fiction, non-fiction and poetry. I ended up choosing fiction; for me personally it is the most challenging. But I want to study all three. So in order to appease myself I have not excluded poetry or non-fiction from my reading lists. Right now I’m working on writing a story that is about a place as much as it is about the people in it and I’ve tried to choose books to read that will aid me in this process. This month I was lucky to have stumbled upon a new book written by an Alaskan author who does this so eloquently that I feel I could read it over and over again and each time glean a new angle in my approach to writing about the way a place can influence and shape the people who reside there. 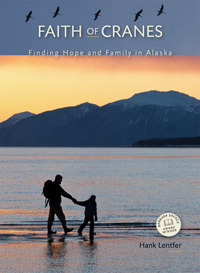 I was initially drawn to the memoir, Faith of Cranes: Finding Hope and Family in Alaska by Hank Lentfer, because of its title. Sandhill cranes return to my neighborhood outside of Homer every summer and I’ve always felt honored to share space with them. Their return every spring is one of the most hopeful things I know of. My own teenaged children, who don’t always seem terribly observant of the natural world, take notice of the cranes and are always thrilled when they first see them flying overhead at the end of every long winter. When the cranes leave each September, almost always on the 16th day of the month, it’s with mixed emotions; we’re in awe of the magic of migration and already nostalgic for the summer days that went by so quickly. I was also drawn to the book because of the author’s name. It turns out that the author’s parents live here in Homer and are huge supporters and users of the library where I work. The nosey side of me that is always trying to make connections was eager to read the writing of Jack and Mary Lentfer’s son. Hank Lentfer’s story is a story of coming of age, a story of finding himself trying to make sense of a world that doesn’t make sense but most importantly it’s a story of love. 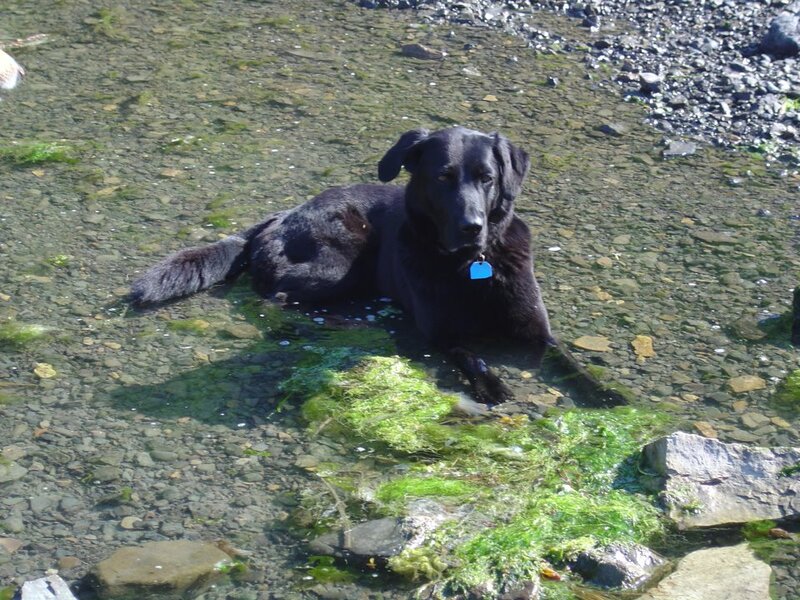 Hank heartbreakingly loves the place where he lives and the wild places where he hunts deer and picks berries and harvests salmon. His story is of coming to terms with his fear of losing the land where he finds spiritual and physical sustenance. It’s also a story of love for the people who share in his connection to a place and the realization that the loss that ultimately goes hand in hand with love is beautiful and hopeful in its own right. How different would the world be if all parents, before conception, considered the responsibility, the joy, the loss and the beauty of bringing a child into existence? The chapter in Lentfer’s book entitled, “Letter to an Unborn Child” was striking in its honesty and its raw expression of his fears about becoming a father in a world that is filled with war, environmental degradation and disconnection. How much living are we, as a culture, missing out on by buying into a consumer-driven mentality? By choosing to slow down and live with less we would be giving ourselves more opportunities to develop friendships, deepen the bonds we share with our families and have more time for self-reliance and art. We know this, and yet it is difficult to extricate our lives from the cycle of filling our days with jobs and tasks we don’t find meaningful. Why is it so hard? As a person who is concerned about things like climate change, wilderness preservation, clean air, clean water and the protection of habitat how do I not lose hope when the news is overwhelmingly bad on all those fronts? And along those same lines how can creativity, love and hopefulness make a difference? If you are interested in an intimate portrayal of a life in coastal Alaska, if you love a place on this earth, if you feel a connection to cranes or any other kind of wildlife, if you appreciate a well-crafted story or if you simply would like to escape for a while into a sensual, thoughtful world, I highly recommend Faith of Cranes. And if you end up reading it, I’d love to know the questions it summoned for you. I’d also love to know what books you’ve read recently that have stuck with you, caused you to consider changes you’d maybe like to make in your own life. Back in July I was sitting in a room full of fellow MFA students I’d just barely met when Richard Rodriguez was introduced to us. He walked slowly to the front of the room to deliver his keynote address. His appearance alone commanded my attention. He’s a small man, with dark skin and Native American looking features. He wore a perfectly ironed, white shirt—something already out of the ordinary in Alaska, and black trousers. His brown skin against the white was striking. Why did that simple notion cause me to have such a strong emotional reaction? Well part of it was in his delivery. He’s an amazing public speaker. But part of it was how he made the average life out to be a thing of beauty. So much writing is filled with ostentatious jargon, or it’s sarcastic or it’s shallow. Richard Rodriguez challenged us as students to write about what is real. It’s harder than you might imagine. So then, what does it mean to be alive? Obviously it means different things to different people. All I can speak with authority on though, is what it means for me to be alive. What do I spend my time doing and thinking about? What consumes me? What inspires me? What makes me want to carry on? There is no doubt that sometimes life is hard. For example, right now we are going on three weeks without running water. The inconvenience of not having water is one thing, but the stress of how we’re going to pay for the repair of our well is something altogether different and more daunting. There’s more. Sometimes in my family there are hurt feelings and disagreements. People don’t always behave the way I think they ought to. The house is never clean enough. Time is constantly scarce. There are always chores that nobody else will do. Recently a close friend was diagnosed with cancer. Sometimes my kids are hurting. Sometimes I’m hurting. And the news, it’s full of terrible, hopeless stories of people going through things a thousand times worse than anything in my life. Is this what it means to be alive? The answer is yes, and yet there is always another side. Right now, as Thanksgiving approaches, I’m trying to think about that other side. I’m reminding myself of the unconditional love I get from my friends and family. I’m thinking about my husband’s job and how it allows my son and I to get an affordable education. I’m thinking about my house—it’s modest and it doesn’t insulate very well, but when the woodstove is thumping and it’s cold outside, there’s no place cozier. I’m thinking about the freedom I feel to express myself. I know that some of the things I write are hard for my family to read, but the fact that they love me in spite of our religious and political differences gives me courage. I’m thinking of the view out my window—the very existence of the mountains and glaciers helps put my problems in perspective and the bay reminds me that life is a changing thing. Mostly though, I’m thinking about how lucky I am just to be here at all. I get to watch my children grow. I get to live with the man that I love. I get to laugh at the funny things and cry a cleansing cry now and again. It’s worth a lot just to be able to think and breathe and feel. On October 2nd we invited a new element of chaos into our lives. We found her on a roadside pullout near our house. It was raining hard and windy. 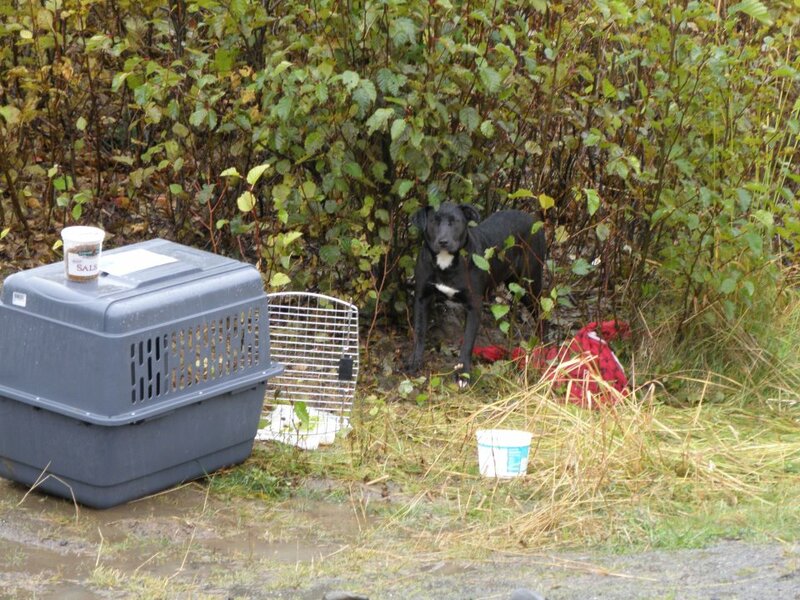 She was sitting there, soaked and afraid next to a kennel. She growled at us when we stopped to check her out. Within an hour she had a name. Gypsy wouldn’t get in the car with us and she wouldn’t let us put a collar on her, but she was happy to follow us home on foot. She did so twice but returned to the pullout and the kennel each time; apparently she had been there for a few days and in her mind it must have been home. Once we brought the kennel to our house though, she stuck around. She wouldn’t come in the house so we put a dog bed on our front porch and set out some food and water for her. All night we wondered if she’d stay. She did. The front door was scary and she wouldn’t go through it. On her third night with us Dillon heard her growling and went out to investigate. A porcupine was walking through the yard so Dillon picked Gypsy up and brought her inside. When we woke up she was pretty pleased with herself at being in the house, but the door was still very scary and she wouldn’t go out. That is when her official training began. It involved opening the front door and coaxing her with food. In four weeks time the coaxing has gone from around ten minutes per door episode to a mere few. This is good considering that it’s almost November and an open door can really cool a house down these days. Sometimes Gypsy cries in the middle of the night and because she’s had a couple of accidents in the house I’m pretty quick to jump up to let her out. If the door seems especially scary I end up pulling on my boots and running out before her, when she sees that the door hasn’t harmed me sometimes she follows. Sometimes she doesn’t and I am outside standing in the yard in my shorts and mud boots calling her. It’s been invigorating really. I’ve seen beautiful night skies. I’ve heard owls and coyotes. Think of the things I would have missed had I been warm and asleep in my bed. Fortunately, Gypsy loves Ripple, our older, much more mature dog (ahem) and the feeling seems mutual as far as I can tell. They started out playing around the yard then figured that if they had fun in the yard they’d probably have a really great time roaming the neighborhood. Dogs roaming the neighborhood is rarely a good idea, and even though they were considerate and brought us souvenirs from their adventures (one day a mutilated bunny, the next day a halibut tail) we’ve resorted to putting them out separately, which would be fine except for the fact that Gypsy had almost gotten to the point of being unafraid of the door when she saw Ripple going through it. Our door time, as we’ve come to call it, was almost down to nothing but we’ve gone backwards now that she has to go through it all by herself again. Have I mentioned that Gypsy is incredibly gentle? Aside from when we first found her, abandoned and afraid on the side of the road, she’s shown absolutely no aggression. She seems genuinely thrilled to have a warm house, a soft bed, a dog friend and four people to dote on her. Still though, it’s taken a while for her to entirely trust us. She loves us but she still gets nervous if we approach her too quickly. It seems like her previous people sent her mixed messages, affection one minute and something much worse the next. It’s going to take a while, but she seems more comfortable all the time. Sometimes we have a set back though, like this morning. We got our first snow of the season last night and so this morning I had the notion that it would be nice to stay inside and enjoy a cup of coffee near the woodstove. I made the mistake of letting the dogs out at the same time. When they came back twenty or so minutes later Ripple had two porcupine quills stuck in her muzzle. Gypsy had about thirty. Dean brought out the pliers and I went to work removing them, but we soon discovered that she had them all over her tongue and inside her mouth. A vet visit was in order. Unfortunately all the things we’d been easing up to—the car, the leash, the vet—had to happen all at once. All of her biggest fears were realized within an hour, along with what I imagine must have been an incredible amount of pain. Aside from the bill, the vet visit was a good thing. Gypsy’s got her shots now and after examining her teeth, Dots, our lovely veterinarian, informed us that Gypsy’s only about eight months old. She’s just a baby. There’s plenty of time to get over the silly fears, plenty of time for her to stop having accidents in the house. Just the week before we rescued Gypsy we had started considering getting a second dog. We’re kind of a two dog family and Ripple was seeming a little down after losing Nayak. Although I will never understand what kind of a person would abandon a puppy on the side of the road in cruddy weather when the Homer Animal Shelter is such an easy option, I do believe the timing and the placement of that person’s bad deed was very serendipitous. Now Gypsy is with a family that is willing to be trained and I’d say we’re doing a darn good job of meeting her every need. In trade she’s giving us a lot of laughs and a fair amount of joy. She’s bringing sweet energy into our lives—and in a household that’s busy and chaotic to begin with, a little sweetness can make all the difference. Today was a monochrome day, the same from morning to evening with the sun never breaking through the heavy layer of gray. It was an unscheduled day that meandered around reading and writing and chores. It’s 9:45 pm as I write this and there is only a hint of light in the sky. I can tell that the bay is perfectly calm by looking at the still, orange reflections of the Homer Spit lights in the water. Night is back again, giving us permission to finally slow down. Our dog Nayak died unexpectedly earlier this week. She was getting old, her back legs were losing their muscle tone and she was beginning to go deaf. Despite her signs of aging though, she still got beside herself with excitement when it was time for a walk and she still held her own when romping around the yard with Ripple, our younger dog. She was fine when we left the house on Tuesday morning and gone when I came home at the end of the day. The house feels a little hollow without her. She was notorious for being nearby her people, but never too close. She had one of the easiest temperaments of any dog I’ve known; she even left this world in the easiest manner possible. We didn’t have to watch a long, slow decline. We didn’t have to make any difficult decisions. She came to us shortly after we moved into this house and lived her entire life here. A lot about this place has changed in that amount of time. The young trees in front of our house that survived the spruce bark beetles have grown so tall that they are beginning to obstruct the view from our front window. The greenhouse, once highly functional and the source of beautiful tomatoes and even a cantaloupe or two has been blown by a few too many windstorms and is now in a sorry state of disrepair. Our kids, who used to think we lived in the coolest neighborhood on earth, now wish we lived in town, with a regular house on a regular street. And our nearest neighbors, who used to be out working their property every day (except the Sabbath), are not getting around as well as they used to. I keep thinking of the title of a memoir at the library that I’ve shelved many times but still haven’t read. It’s called A Three Dog Life by Abigail Thomas. It makes me think about the dogs we’ve had and lost, each one representing a certain phase of our lives. Nayak was with us during the raising a family era. She was with us in this place, on five acres of land thirteen miles east of Homer. She was with us in this house with its green carpet and funky linoleum. Sometimes we talk about moving to town. 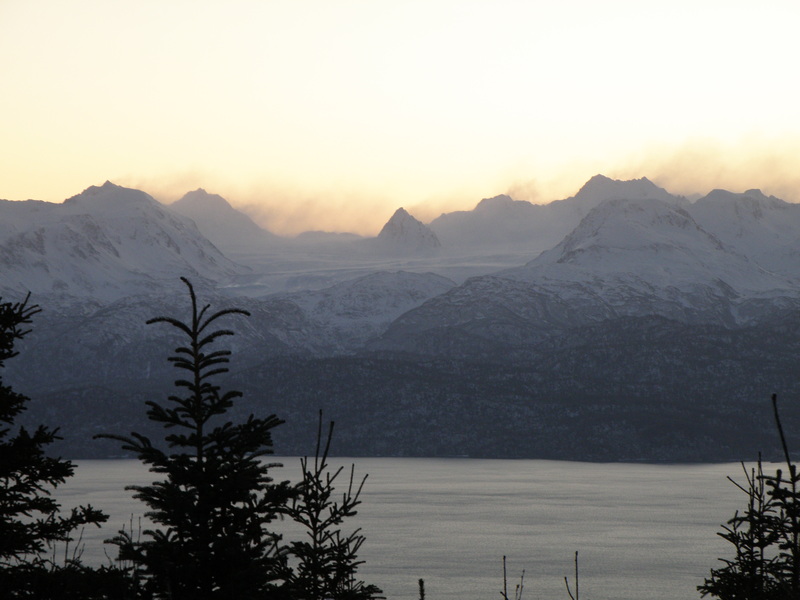 Sometimes we want to leave Alaska and head down south. For today though, I was glad to be here. It was a good day to take it easy. It was a good day to wander around and let the memories of this place, this era, take me where they wanted to go. Lofty Minded in Alaska Blog at WordPress.com.